Primrose, the name of a plant which in old English and French was written primerole, from the Italian primaverola, the diminutive of primavera, spring, which according to Pry or originally belonged to the daisy, but has been in some unaccountable manner transferred to 'primula veris. 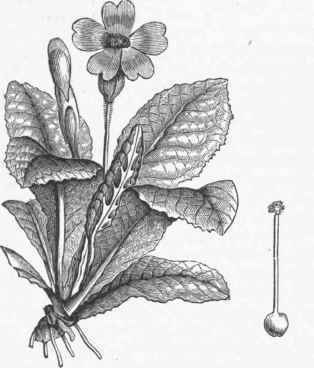 The genus primula (Lat., diminutive of primus, first) gives its name to a rather large and ornamental family, the pri-mulacece, which is very frequent in alpine regions; it is distinguished from other monopet-alous families with regular flowers by having the stamens opposite to, and not alternate with, the lobes of the corolla; they are herbs with radical or opposite or whorled leaves, four or five corolla lobes and stamens, and a one-celled, many-seeded capsule. 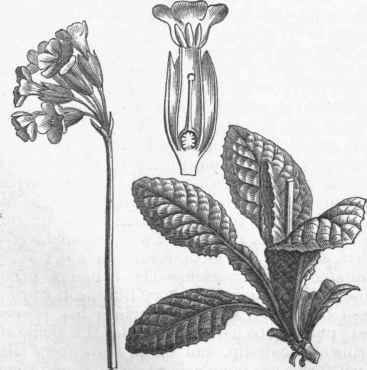 In primula the leaves are all radical; the solitary or umbellate flowers on radical stalks; the corolla with a straight tube, and a five-lobed, spreading limb, the divisions of which are often notched or two-cleft. There are two native species of primrose found along the northern borders of the eastern states, both somewhat rare. The bird's-eye primrose (P. farinosa), also a native of Europe, has the under side of its obovate lanceolate leaves, upper part of flower stem, and calyx covered with a white mealiness; the flower stalk 6 to 10 in. high, bearing several (sometimes 20) handsome, pale lilac flowers, with a yellow eye. The Mistassinnie primrose (P. Ittistassinica), so called by Michaux because he first found it near a Canadian lake of that name, occurs from Maine to northern New York and westward to Michigan and "Wisconsin, along the shores of lakes; it is a very pretty little species, its veiny leaves not mealy, and having from one to eight flesh-colored flowers, upon a stem 2 to 6 in. high. Several other species are found on the mountains of the far west, one of which, first discovered on Pike's peak by Dr. O. C. Parry (P. Parryi), and since found on other Rocky mountain peaks, is one of the most beautiful of the genus, having very large-flowers of the richest purple. Attempts to cultivate it have failed; in its native localities it blooms along alpine streams where its roots are bathed with ice-cold water from melting snows, a condition not readily imitated in cultivation. - The common primrose of England and northern Europe, the primrose of poetry, is a plant which has proved very puzzling to botanists; under the names of primrose, cowslip, and oxlip, three very distinct forms are popularly recognized, and some botanists accept these as three species, while others return to the views of Linnaeus, who placed them as varieties of one species, P. veris; these varieties or species have by crossing produced several other forms, and in the confusion thus caused it will serve the present purpose to accept the popular classification. The common or true primrose (P. veris, var. a, P. vulgaris, and P. acaulis of different authors) has wrinkled and toothed leaves, which are hairy beneath; the umbel is nearly sessile, the scape or common flower stalk being very short and concealed by the bases of the leaves, so that the flowers appear as if solitary on radical pedicels as long as the leaves; the flower has a flat limb and is of a pale sulphur-yellow. This is the original of the cultivated polyanthus; it is so abundant in pastures and hedge banks in England as to be regarded as a weed. 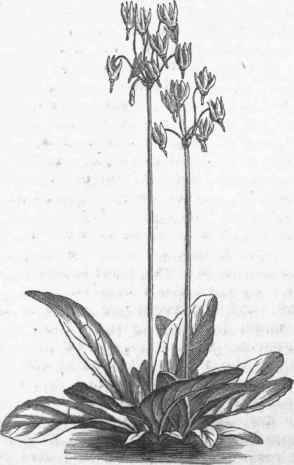 The cowslip (P. veris, var. b and P. officinalis) has leaves with winged petioles, not hairy but often with a pale down, the flowers in an umbel which is raised upon a stalk above the leaves; flowers buff-yellow, varying in size, but smaller than in the primrose, and the limb concave or much cupped. It is found in similar situations with the preceding, and both ascend the mountains to the height of 1,600 ft. The flowers contain considerable honey, and are in some parts of England gathered in large quantities, when just opened, and fermented with water and sugar to make cowslip wine; the root was formerly used as an astringent, and the leaves are employed as a salad and a pot herb. The oxlip (P. veris, var. c and P. elatior) has similar foliage to that of the cowslip, and the umbels are also on distinct stalks; it is intermediate between that and the primrose, from which last it differs in having its umbel raised above the leaves, and from the cowslip it mainly differs in its broader and flatter flowers. The names of both cowslip and oxlip are of very uncertain origin. These three are frequently found growing together with puzzling intermediate forms. Their flowers afford abundant examples of dimorphism; L e., in some the pistil reaches to the top of the tube of the corolla, the stigma showing like a globular knob at the throat, while the stamens, attached to the sides of the tube, are about half way down it; in other specimens the pistil is only half the length of the corolla, while the stamens are placed at its throat. This arrangement is one of the many to insure cross fertilization, as an insect visiting a long-styled flower in search of honey would have its proboscis dusted with pollen at a part which, when it visited a short-styled flower, would come just opposite the stigma, where some of the pollen would be deposited; and, vice versa, pollen from the short-styled flowers would be carried to fertilize those with long styles. Primroses, cowslips, and oxlips are much less frequently seen in our gardens than formerly, partly from their being displaced by more showy flowers, and partly from their uncertain hardiness. Though the natural color of the flowers is yellow, there are varieties ranging from white to purple, and also some double ones. The polyanthus, a variety of the primrose, ranks as a florist's flower; its colors are clear yellow and brown, with the divisions between the colors well marked, and there are double forms; it is safer to protect polyanthuses in a cold frame, but they often succeed in the open ground. All the foregoing are raised from seed, sown in early spring; the .plants, if kept growing all summer, will be large enough to flower the next spring; after the flowers fade the plants may be divided into as many pieces as there are buds or crowns to the root. - The auricula, primula auricula, is another of those beautiful old flowers now neglected and almost forgotten; it is a native of the mountains of southern Europe, and difficult to raise in this country on account of the great extremes of heat and cold. In the manufacturing towns of England and Scotland the workmen cultivate it in great perfection, and have auricula shows at which the competition is very active. The thick, oboyate leaves are in a radical cluster and mealy; the flower stalk, 6 or 8 in. high, bears six or eight flowers, which are fragrant and sometimes double; the colors are from white to dark brown, those being most esteemed which have alight-colored eye edged with some very dark color, and abundantly covered with a powdery bloom or mealiness.-Primula cortusoides, from Siberia, is a charming plant and hardy. The new Japan primrose, P. Japonica, while it does not warrant the extravagant praises with which it was introduced a few years ago, is hardy near New York, and a desirable plant.- Among greenhouse species, the most prominent is the Chinese primrose, P. Sinensis, which has round-heart-shaped, several-lobed, downy leaves on long petioles, and umbels of large, showy flowers, which have an inflated calyx; there are numerous varieties, single and double, from white to purple, and one race with the lobes of the corolla beautifully cut-fringed. This is one of the most popular of greenhouse plants, and well, suited to window culture; it is easily raised from seeds, and slowly multiplied by cuttings. Large quantities of the double white are raised by florists for winter decorations.-American cowslip is dodecatheon Meadia (Gr. , twelve, and , gods, one of Linmeus's fanciful names), of the same family. This is one of our most beautiful wild plants, and is often cultivated; it is found in rich woods from Pennsylvania to Wisconsin and south westward. It is a smooth perennial with a cluster of oblong leaves, and a naked stem a foot or more high, bearing an umbel of pale purple flowers, each one of which droops in a graceful manner; the lobes of the corolla are long and narrow, and sharply reflexed like those of the cyclamen, which gives them an appearance that no doubt suggested the name "shooting star," which it frequently bears at the west. There are white and other varieties, all fine for the garden. Cowslip (Primula veris, var. b).